The first ever public demo of Super Mario Epic 3! 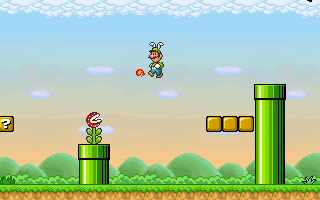 Take control of either Mario or Luigi and explore the playable level, Sunset Acres. At last! !...Oh,it`s a demo.Well,still quality stuff! Everything was perfect! Great job Jeff. That was a lot of fun... this engine runs smoothly. I'm glad to see all that hard work paid off. Great job. I'll be looking forward to the final release. THIS IS AMAZING! Keep up the awsome work! Very enjoyable with olny minor flaws (but since it's a demo, that's probably ok). :) Great stuff. If you make a sequel, then it would be revoultionary! This game is #1 on the Citrusponge Fangame Anticipation Meter :O! Why couldn`t you make the rest like this?! Yes! He should do that. great gameeee!!!!! Good work jeff. And a little glitch: if you try to bash a ? block crouched, and you release the DOWN in the same instant he touches the ? block, mario should be trespassing the block! Jeff silvers. is this true?! SME3 is cancelled?! The sprite of SMB3 is much more good then SMW sprite. The game is perfect! Graphics is perfect, sounds is perfect. I wait for the full version! EDIT: Not cancel this game, please! It´s the more greteatest fangame ever! and you will start a secret level with more power ups!!! Here's another little trick: In the beta test level, press Z to instantly change your character into Luigi, and press X to change into Mario. There's a small bug here: if you come out of the ducking position right under a block, you'll go through it. Yeah, I've since fixed that (the demo still has the glitch, but the final release won't). That's less of a glitch and more of an example of my laziness (I haven't programmed death in yet). You canned SME3 again. You haven't done anything with it lately. Please continue the progress. Please!!!!!! We all want it done. I am a SME2 fan. I just want to play more of SME3. I guess I will stick with SME2 forever. I canned SME3? Well I wish somebody would've told me; I wouldn't have wasted all this time the past few days working on it! make an engine of doing this game! like picking up enemies and carrying things! I twill be useful. Sme3 is one of the greatest games on this particular planet! It's great! It certainly looks like a classic fan game in the making! I can't wait to see more! 1. Just right of the first Piranha Plant. 2. Just left of the first Venus Fire Trap (you're supposed to get it by kicking the Koopa shell down there, but since I'm too lazy to program dying into my demos, you can just walk down there and get it). 3. When you get to the two tall pipes past the Venus Fire Trap (there will be a row of ? Blocks next to the left one), go down the right pipe. Hit the P-Switch to turn the blocks into coins and get the Advance Coin. 4. Immediately after you get the third coin, exit the Bonus Room and head right when you emerge from the pipe. Use the brick platforms to get the fourth Advance Coin (before they turn back into coins). 5. The fifth coin is near the end of the level (you can't miss it; it's under a row of ? Blocks and brown blocks, amongst two Shyguys and a Koopa Troopa). No, it isn't; you have to go down one of the pipes and hit a P-Switch to temporarily turn the regular coins into bricks (and visa versa).